Welcome to the September ePlay Challenge. Our challenges are about encouraging you to explore your creative journey and inspiring you to step outside of your comfort zone. When you submit your artwork, share a unique card, scrapbook or journal page, a canvas, home décor project, or anything that you’re excited to share! We’re looking forward to crafting with you! One project will be chosen at the end of this month-long challenge and will be awarded a $25 shop voucher for the eclectic Paperie store. It just might be you! Hi Everyone! 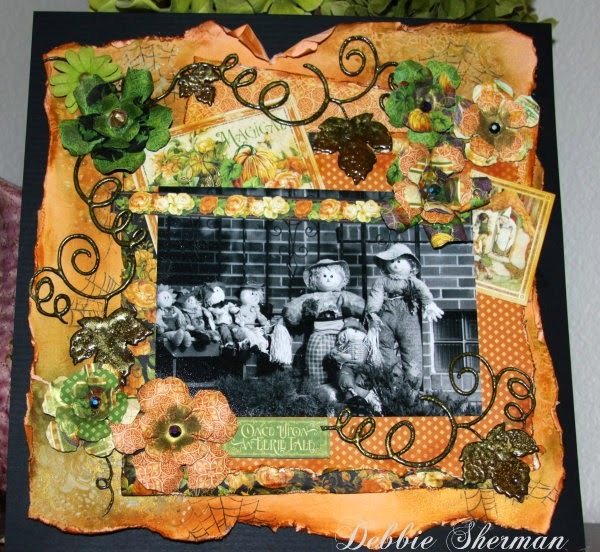 Debbie with you today to share my September ePlay project. This month we are celebrating Fall so show us your best Fall projects!! !Every year my neighborhood goes all out for Fall Decor and while on a walk one day I decided to take my camera along and take some photos of all the scenery. This cute scene of this scarecrow family was one I couldn't pass up. When I saw the new Graphic 45 An Eerie Tale I knew it would be perfect for this photo. I added some sprays and inks and stamping to the background and for the chipboard treatment I used a fun technique I'd like to share. Step 1. Color your chipboard with ink. I used Distress ink in Rusty Hinge and Shabby Shutters. Step 2. Cover the chipboard with VersaMark Ink. Step 3. Cover with Utee Clear Embossing Enamel and heat. Step 4. Spray with your favorite spray inks and reheat. Hope you give this a try I can guarantee you will try it again and again. Thanks for stopping by the eclectic Paperie Blog today and can't wait to see your Fall challenge projects. What a fun fall picture to highlight on your lovely fall page - I can just smell the crisp air! Love the layout and that leaf looks awesome. Will definitely try that chipboard tip. :-). Yes, those papers go perfectly with that photo! Debbie just an adorable layout. Love all of it. Very impressing way you made the leave. Makes a great impact when treated this way. Love the photo! It completely embodies fall! Love all the twisty curlies of your fall chippy piece too. What a divine LO. Such a colorful happy page.Happy to have linked my project too...love the theme! So, so pretty...fall colors make the most awesome of layouts! Gorgeous layout. Loving the colors. I am your newest follower! I just discovered your challenge and I wanted to play along so I just linked up my card. Your inspirational projects are awesome!